Suzdal (Су́здаль;) is a historic small town in Vladimir Oblast east of Moscow Russia, about 25 km north of Vladimir. It was once the capital of several Russian principalities and has many examples of early Russian architecture. It is probably the most interesting of the Golden Ring cities. During the time of the Soviet Union, nearly all of Suzdal's economy was planned around its tourist potential. As a result, very few modern buildings were constructed in Suzdal (by law there are no structures more than 2 stories high except cathedrals). Also, a number of wooden structures from other parts of Russia were transported here, and the whole city was converted into an 'open-air museum'. Unfortunately, Suzdal's dependence on tourism also meant its economy came to a standstill when tourists stopped coming after the dissolution of the Soviet Union. The town's tourist trade now appears to be slowly revitalizing itself however, mostly due to an influx of affluent Russian tourists from Moscow and elsewhere. 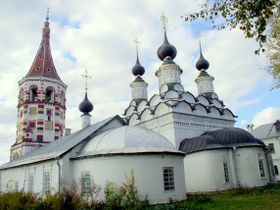 Suzdal retains a rustic old Russian, Soviet-era atmosphere. You will not find any McDonalds restaurants or any trace of Western chain shops or hotels here, but locals feel that certain aspects of the town are on the cusp of being "Disney-fied". Livestock wandering the streets and elderly women washing clothes in the river (and tourists wielding digital cameras) are regular sights in Suzdal. There are no trains to Suzdal, so aside from organized bus tours, the only way to reach the city is by bus or car. There is one daily bus from Moscow's Shelkovskaya bus station. However, a more convenient option is to first visit Vladimir, and then take a bus from there. Direct buses depart from Vladimir to Suzdal every thirty minutes (except 11:30 am), and buses bound for Ivanovo also pass through. Special private tour buses to Vladimir and Suzdal also operate from Kursky Train Station (Metro: Kurskaya, Chkalovskaya). Prices and destinations vary. Trains leave from Moscow to Vladimir from Kurskaya Train Station. Buy tickets at the regional (short-distance) train ticket counter. This is the right wing of the Kurskaya station (Poezda Prigorodnogo Napravleniya - Gorkovskogo). Tickets cost about 300 RUB one way from Moscow to Vladimir. There are several daily departures with the earliest at 8:12am. Alternatively you can take the long distance express train, which is only about an hour and a half. Prices vary and you may need to book in advance for these trains. From Vladimir train station exit and walk 50 meters across the parking lot to the Vladimir Bus Terminal. Purchase a bus ticket at the ticket counter (95 RUB one-way) and ask for the number of the platform. The tickets have assigned bus seat number (zero denotes no seat), so pay attention, as somebody may take your seat if you do not claim it. The bus ticket is valid up to the bus terminal (avtovokzal), which is located 2 kilometres outside of the town centre. From there, some of these buses will continue on to the town centre but a separate ticket (17 RUB) must be purchased from the bus driver. Most of the attractions in Suzdal are located along the Lenin St (ул. Ленина), including the Spaso-Evfimiev Monastery. Local buses ply the small town (RUR 14). Notably, the monastery and the city centre can be accessed from the bus station by line #2, which arrives approximately every half hour. July 16 - Cucumber Day. A funny holiday, based on the fact that Suzdal's cucumbers have a reputation as the best cucumbers in central Russia. This holiday is celebrated with a folk music festival. Trapeznaya. Located in a room of the refectory of Suzdal's Kremlin, this restaurant features a traditional Russian menu of bliny (pancakes) with caviar, priced much lower than in Moscow. Try their marinated forest mushrooms - they are beautiful and tasty, whether eaten plain or alongside a serving of cold vodka. The beverage of choice in Russia is vodka, by far. Suzdal, however, is famous for another drink, medovukha (mead), a Russian type of cider made from honey. Tourists should be wary of purchasing this drink on the streets, though, for counterfeits are common. Ask your guide where you can buy real medovukha (mead). Suzdal is unique among Russian cities for its wide variety of choices when it comes to places to stay. There are many small hotels with 5-20 rooms. Advance booking is crucial for those who intend to visit during the New Year holiday season, Independence Day, and during the summer high season. "Tourist" is the largest hotel, with a 3-star rating. It is ideal for backpackers, and features "cottages" with attached garages. Sokol, A large hotel currently under renovation after a fire. Heliopark aka "Goryachie klyuchi"  Address: ul. Korovniki, 14. Tel. +7 (09231) 28-000, +7 (0922) 42-02-77, fax. +7 (09231) 2-41-01 . A complex of hotels with big wooden rooms and a sauna, situated in a very quiet locale. From here, it takes 20 minutes to walk to the town center, and nearly 40 minutes to walk to the Kremlin. Priced from RUR 4 000.00/room. The Suzdal Bus Terminal is located on Vasylevski Street. It is a 20 minute walk from the city center, or a short taxi ride. Regular buses leave from Suzdal to Vladimir at short intervals (approximately 30 minutes). At least one daily bus to Moscow leaves at 5:15 AM (arrives in Moscow 10:15 AM - Shelkovskaya Metro - east end of blue line). The Suzdal bus station is rather primitive, with minimal snack and toilet facilities available. But, it is a long walk to town, and taxi drivers who charge locals about 5 or 10 rubles to drive there will charge tourists up to 200. But, if you are coming by bus from Vladimir, do not get off there. The same bus will take you on to the center of town, unbeknownst to many visitors. This page was last edited on 19 September 2018, at 12:39.